Pope Bergoglio carrying a Stang. Note the prominent iron nail, and the human form at the base of the fork. Textbook Stang. ”In his opening address, the Pope attacked “clericalism” — as if he were not the most clericalist man in the world, refusing to respond to the Viganò accusations that he protected and promoted Ted McCarrick. He also railed against “blogs”, meaning we are doing our job right. The “contraption” was in fact a “stang”. Why, do you think, would the pope prefer to hold a stang, with the sinister evil this thing symbolises, rather than a crozier with a Crucifix, the symbol of our redemption? 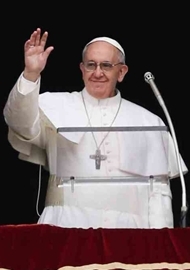 And a h/t to JH for alerting us to the indomitable Ann Barnhardt’s post on this latest scandal: “Satanists Manifesting: Antipope Bergoglio Carries a Stang – the Ritual Staff of Witchcraft”. There was another one from her today about the woman who handed him the wtches’ stang. Should we not all be up in arms at this latest horror from Pope Francis? Maybe we might simply have to admit that Catholics are becoming inured to the horrors we have been subjected to under Francis coming, as they are, thicker and faster than ever before these days. Certainly, in general, we no longer demonstrate the shock and anger such an outrageous deed as this one really deserves. I feel like I’m back in time of the Obama era. One horror after another. One outrageous law or regulation after another. We can’t be more shocked than we already are with new changes most libtards take as Gospel to believe. And we who wish to be faithful think we can only pray and follow what we know to be true from years ago. A revolution would be futile, since we are not only too far away but this is not a democracy or a republic. Our protest would not be heard and our dissent would be perceived as rude or disrespectful. What’s the solution? Pray 5x a day. More if possible. “Should we not all be up in arms at this latest horror from Pope Francis?” The Pope didn’t know the meaning of that staff, aside from the Christian message it Hinted at. It does illustrate the types of attack the Church is facing . I wonder if Francis might use this example in a future homily. I do suspect those presenters did present it to the Pope as a witch’s Stang, I think he accepted it out of Christian kindness. I am afraid that the leader of the 1billion faithful of the 2,000 year old Church of Christ would not carry a symbol of the devil at the opening ceremony of the synod and not know, or be advised, what it was. The very act of changing the symbolism of the ferula with the crucifix would require consultation, discussion and analysis. Ann Barnhardt pointed out that evidently at some stage, they must make a public declaration. I am not surprised that Pope Francis railed against blogs – they are shining a light on his and his allies acts, which would normally have been under cover of darkness. Remember Archbishop Viganò ‘s words – do not leave the Church and pray hard. I agree that this pope must have known the significance of the “stang,” but I think he simply doesn’t care about such things. After all, he apparently believes that evil souls don’t go to hell; they’re simply annihilated. (https://bit.ly/2GAv6vF) So why should he worry? Northernhermit @ 21:58 – Why do you say “The Pope didn’t know the meaning of that staff…I think he accepted it out of Christian kindness”? On what grounds do you say he was unknowing? You only say that because you want to believe it. Are you a close confidant of the pope? On what grounds should we *think* he’s entitled to a “Get Out of Jail” free card for this latest lapse? Certainly, an occasional lapse in judgement by him or anyone deserves the benefit of the doubt, but Pope Francis has form. 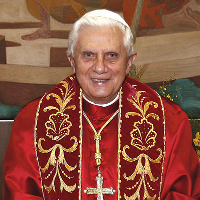 If this had been Benedict XVI accepting the “stang”, no one – hardly anyone – would have seen it as a sign of apostasy or worse; but from all the signs we’ve seen, from all the things Francis has said and done these past 5 years, Catholics have to be almost deaf and blind if they do not suspect, as do I, that Francis is sending a message: that message basically being one of Latitudinarianism if not Universalism. …and as Crow deftly reminds anyone who does not understand Vatican stratagems, tactics and maneuvering: almost everything the pope does publically is carefully scripted in advance – each jot, tittle and movement being planned, approved and rehearsed, as it should be – which is not to say I approve of this script. 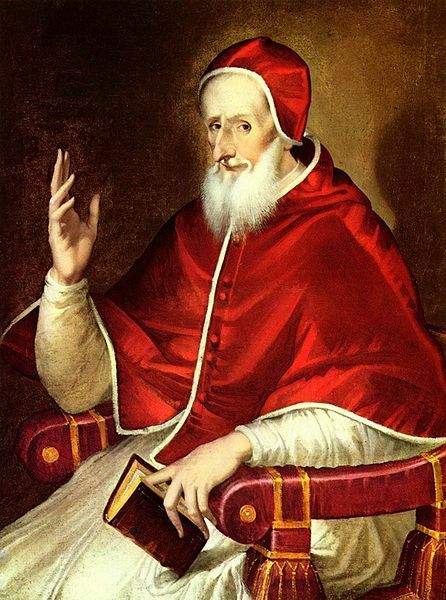 I just attended first Saturday Mass and our priest talked about Pope Pius V and the rosary of Lepanto. It made me think that the Catholic faithful could fight the most effective battle by simply by gathering in St Peters Square and praying the Rosary, much the same as the Rosaries were said in Ireland and Poland and England, in a group. They could finish with the prayer to St Michael. It may be that this Pope is naive and Christian, but in my view, he has form. The Church needs the Rosary for the sinful clergy in any event. Yes, JH, about the script. I have acted at enough official occasions to know that nothing is left to impromptu chance. The young people would have been rehearsed and the Stang would have been given to them. It would not have been the case of Miss Red Bangle suddenly and spontaneously turning up with a Stang- hey guess what, here’s a surprise! I look back to the time in my country’s past when Mass was offered 150,000 times in one city over 127 hours without one interruption starting exactly 2 years to the day before I was conceived. My son and his wife are perplexed why I insisted they tell me the date of conception of their first born. If this fails again, I’m sorry. It’s a deeply Catholic film special to me recorded in 1947. The devil has control of the internet. God bless all Catholics who fight to preserve our Faith. Were the photographs snapped right after he was handed that staff, were they taken at the same event? If Catholics are looking for every reason to ridicule the pope, imagine what the enemies of Catholics are doing. The video was the most beautiful Catholic display of devotion that I have seen in 50 years. It almost made me cry. thank you. To see Cardinal Mindszenty before he suffered was a joy. So many many glorious looking groups … like The Knights of Columbus, and, the clothes on the people! All the ladies had hats and the men were dressed in suits. This is what I remember!! This is what I cry for because it is lost ! I thank you for your compliment on my video link, Mary Anne. I fully endorse your admiration of József Cardinal Mindszenty. As Fr Maurice Proulx (the narrator) prophetically says at the 5:13 mark, he was a “martyr for the Hungarian Church that will one day be free”, as it became again some 40 years later and remains to this day. It makes me sad to think I was not Catholic when born in Quebec 3 years after this event (which took place in our nation’s capital just across the Ottawa River from Quebec). So much I missed out on during my formative years. In those days, Quebec was – after Rome – the epicentre of the Faith. Neither Quebec nor Rome can still lay claim to that honorific, which now belongs to Budapest or Warsaw or Krakow. Hmm – what about the information Archbishop Vigano sets forth in his 11 page letter a few weeks ago stating that he personally told the pope in 2013 that McCarrick had been credibly accused of sexual abuse, which is five years before McCarrick was finally suspended? This is just another example of the secular/agnostic media giving Francis the benefit of a doubt to which he is not entitled. In other words, northernhermit (not in my neck of the woods, I hope), “the enemies of Catholics” you refer to quite like our pope. He doesn’t even try to hide it. That’s how shameless he is in his ambition to destroy the Catholic Church to make one to his liking. Even the Daily Beast is waking up to the reality of this crazy Pontificate. And as mmvc’s link points out, the Church’s sworn enemies are merrily “singing his praises”! Also the Dionne Quintuplets. I was around when they were born. Oh my! I had a silver teaspoon with one of the Quints on the top. Everyone was so excited about it. wow! Our family was involved in a group in Rougemont, P.Q. a long time ago. Michael. They are good people. He suffered terrribly before the embassy. Then he had enemies there too as they wanted him out. While he was in Hungary, it was a solace to the people. I read his diary. Viva Christo Rey! Of course Francis must have known what the ‘staff’ he was given really was. He is a Jesuit after all and apparently their formation is long and comprehensive. It was not just a rustic ‘blank’ staff either, it was a stang, with inscribed sigils, I.e. script wrirtten in symbols to enhance the magical intent of this occult tool. Enough is enough and so many people are asleep. Libera nos a malo.